I’m about a year into my yoga practice now and it has been a tremendous asset in my fitness lifestyle. I am no where near being considered an experienced yogi (yet ☺), but I have definitely come a long way and very proud of that. I’ve gained more mental clarity and focus, increased my flexibility, and developed my strength and agility. Yoga only requires your presence. However, whether you decide to practice in a yoga studio or in the comfort of your own home, here are 7 basic essentials that may enhance your experience. Yoga mat: Most yoga studios have communal mats available for students. However, if you plan to practice regularly, it’s worth it to invest in a high-quality mat such as a Manduka mat. Although pricier, these mats are sturdy, lightweight, and come in a variety of great colors. Cheaper “sticky-type” mats tend to fall apart and shed “confetti” everywhere. (My husband and I recently had that experience when we dropped by a yoga studio during a visit to India). Yoga towel: I practice HOT yoga and sweat A LOT!!! If you do the same, you’ll want to have a yoga towel. Yoga towels are made of microfiber, super absorbent, and fit perfectly over a yoga mat. Yoga block (or yoga brick): Yoga blocks/bricks can be used as a hand or footrest when inflexibility and or unsteadiness prevent you from reaching the floor during a particular pose. They can provide support for your back (during reclining and restorative poses) and other limbs as well. Yoga blocks/bricks are offered in multiple sizes with the most common being 4″ L x 6″ W x 9″ H and 3″ L x 6″ W x 9″H. 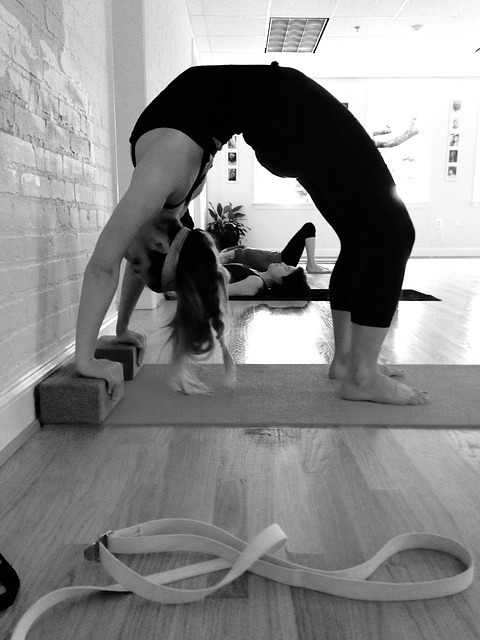 Yoga strap: These are fantastic for those who aren’t very flexible. Straps provide length and assist with poses where your arms aren’t flexible or open enough to reach your feet or other body areas. Yoga instructors may also use these as a support to help you go deeper into poses. Yoga bolster: These are pillows that provide you support and enable you to relax in various poses. Yoga bolsters are great for beginners and those who are less flexible with some physical limitations. They can help you stay longer in certain poses allowing you to focus on your breath, instead of struggling with supporting your body. Yoga bag: If you have a yoga mat and practice at a yoga studio, then this is a must! Carry your mat around easily and in style making sure that it does not unroll at the wrong time. Yoga outfit: I have to admit, I love my yoga outfits! And yes, if you live in the Pittsburgh area, you will spot me in my yoga gear at the grocery store and running errands ☺. But for your yoga practice, you will want gear that is flexible and will not hinder your ability to move through poses. So yes, invest in a few tops and pants. Those are your basic essentials for you to pick and choose. As stated earlier, yoga only requires your presence. Incorporating some (or all) of these items can only enhance your overall experience. My hope is that you will reap the benefits and rewards in your practice as I have in mine. Namaste!